When he inevitably heads off into the sunset for the pastures of whatever city will take him, it comes time to take stock of a player and look not just at their statistical contributions but also what they mean to a team, to fans, and in a roundabout way to a city as well. Some men are nothing but numbers; some men are nothing but characters; but there are those who bring with them full-bore sea changes in how fans can view their team, and what those fans might dare expect. This is not to say they bring some kind of magical witchcraft or otherworldly charisma, but that the things they do and the contrast between how it was done before have changed the very culture surrounding a team. When he first arrived, there was a certain quiet optimism in the air. He’d been hurt before, and not in any small way. He’d been a part of winning teams that ultimately won nothing, but thanks to his low profile no one equated him with any kind of success; truth told, no one really equated him with anything, instead relegating him to a sort of second-tier, background bat who would never rise to any kind of elite level. He could be good, we thought, but not in the way we need. Or so we assumed. Before him, good meant something else. “Good” didn’t mean timely or useful; “good” meant attacking with brute force. “Vital” was equated with “bomb squad” while “athleticism” meant “can hit a three-run homer.” The thing was that while he couldn’t attack as savagely as the wrecking crew that came before him, he could cover enough ground to make those three-run homers unnecessary; where his predecessors were down by two with two outs, the new guy was down by one with a guy on third. The team was playing a new game with the new guy, but also because of the new guy. He didn’t just bring his game but went so far as to change our game. Not the Sox’ game, but our game—the fans’ game. We didn’t have to wait for the air strike because suddenly things like a sacrifice fly or a diving catch were viable options. The team was going to win, and this guy was going to be a big part of why. The Sox had seen good, even great players before, but none who so subtly changed everything. And yet, the discussion of his golden years on the South Side really only covers two seasons; the one where he put together one of the finest all-around campaigns in team history, and the other where he won an award no Chicago baseball player had ever won. Spectacular catches brought chants of “M-V-P!” from the stands. The Home Run Derby came calling. John Rooney screaming “Base hit! Harris scores and it’s one-nothing White Sox!” He gave a good face to the franchise through his now-legendary charity work around town even after taking a lowball offer to play here in the first place, and in return drove in the most important run the city had seen in 88 years. Of course we know how this story ends, not in glory but in something as mundane as a buyout and a long goodbye, maybe a winter of questions and nonsensical, sentimental what-if scenarios. But as the decade ends, and as we bid farewell, let us remember him not as the man with the horrid ending to his South Side tenure but as the man whose arrival changed the very definition of a power-hitting White Sox outfielder. It’s okay to hit the longball and be a decent fielder. It’s okay to know how to drive to the opposite field. It’s okay to have enough speed to take the extra base. It’s okay to hit a single when a single’s all you need. He’s the reason we demand so much of Carlos Quentin, and he’s the reason no one misses Carlos Lee and Magglio Ordonez. He is why we want to believe in Alex Rios, and he is why we still can’t stand Scott Podsednik. He was a great player and, for a little while, he was the most important player the White Sox had. Not the best, not the most famous, certainly not the most glamorous, but far and away the one we needed the most. Five seasons. One-hundred sixty-four home runs. Four-hundred sixty-one runs batted in. Fifth- and fifteenth-place finishes in MVP voting. An All-Star. A Silver Slugger. Most Valuable Player of the 2005 World Series. Ladies and gentlemen, Jermaine Dye. The 35th Street Player of the Decade. Mr. Dye, take a bow. 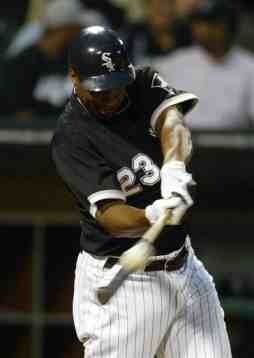 JD is by far my favorite White Sox player in some time, I may even go as far as to say my favorite of ALL-time. I shed a few tears after the year he had and I would love to see us sign him to a “lite” contract and keep him until he hangs his spikes up for good; but that is just wishful thinking. Jermaine, we had some good times together I wish you well wherever you go and will cheer for you no matter where you end up. I would’ve gone with Burls, but JD is a great choice too. I was pretty excited when we signed him. My brother used to live in Missouri and has followed Jermaine since he was with the Royals. I remember him telling me JD would do a lot of good for whoever his new team was even before we signed him. I’d say it worked out ok! Maybe he is not really gone for good but like Scott above I really wish him the best with his new team. A nice tribute to Mr. Dye. I think his stature will grow in Chicago as the years pass. I don’t think many White Sox fans (including me) ever gave him full credit for what he did for the franchise. hated to see him struggle so much this year. no problems though. that won’t be the jd i remember. Don’t worry, it will only be 6-18 months before we trade some prospects to bring him back in our usual fashion: love of former players + aged slow power hitting OF = win! You were great for us J.D. Thanks for the memories and good luck. Very nice tribute to one of the classiest players to ever play for Our Sox. I’ll never forget what you did for us in 2005, Jermaine, and I know at least one fan who will cheer you until she loses her voice when you return to U.S.C.F., no matter who you return with.